Happy belated new year to you! 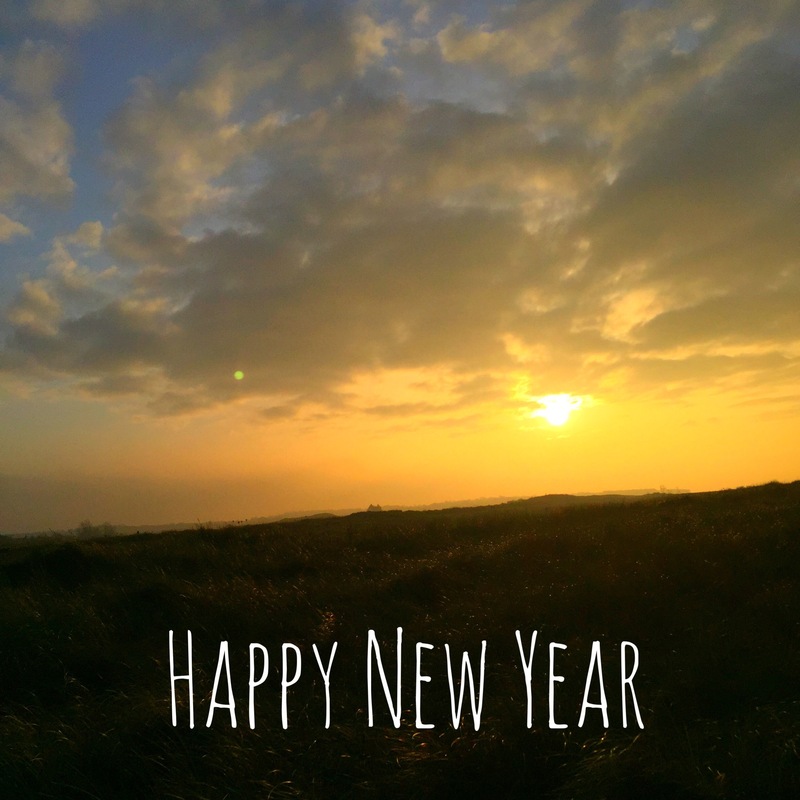 This post is a little bit late as we saw 2016 out with Will’s parents at their new house on the North Norfolk coast, which is internet free at the moment – is near a rather lovely beach where we saw a stunning Winter about to set sun. Our November run of illnesses and breakages unfortunately continued into December. After a bout of a vomiting bug, more colds and the house still being a tip after the leak that happened whilst the boiler was being fitted (they’d had to rapidly move the piles of stuff we’d cleared for them to do the fitting all over the place as they were trying to find the leak as quickly as possible and were taking the floorboards up!) we called time on the plan of us hosting Christmas, as Will’s lovely Mum offered to cook lunch at their house instead. We were so grateful and it was a good thing we’d changed the plan as the oven then conked out a few days before Christmas. What with that and the dishwasher breaking, and the fact that the rest of the kitchen is heading towards the end of its life anyway we are going to replace the whole thing (if it’s in anyway in our budget from the money we’ve been putting aside for the purpose – a big if!). What with all this, and the general grimness of the world more generally – I am not sad to say goodbye to 2016. December wasn’t all bad though – we celebrated my 30th with a trip to the Ritz for afternoon tea. It was lovely and I’ll write a whole post about it at some point! After we recovered from our various bugs and finished work for Christmas we did manage to have a lovely relaxed time, pottered about at home, had a wonderful Christmas Day thanks to Will’s Mum and Dad, had a day out to London Zoo using the membership we got as a Christmas gift, then topped it off with our trip to Norfolk. Hoping this means a good start to 2017! I’m not a big one for New Year resolutions – mainly because I tend to make lots of ‘must do better’ resolutions and changes throughout the year and I prefer being a bit gentle and hopeful with myself at the start of the year in the dark and the cold. I think last year’s hopes strayed a little bit into resolution territory and I didn’t do so well with them as I did the previous year as a result. I’m going to take a different approach for 2017, but I thought this was a good time to reflect back on my 2016 hopes. Being more thoughtful: this was all about remembering to think about our wonderful friends and family more, and generally I think I managed this quite well. Going back to work has meant I have ‘the book’ of organisation which if I lost it would mean we don’t know what we’re doing, eating or anything really. This has helped me keep track of things more which is great at feeling less reactive and guilty when special days for people go whizzing past. Enjoying my particular life: not overly comparing myself to others (especially where parenting is concerned) – this had mixed results. I can definitely not claim to have never got stressed about Felicity’s sleep in comparison with others, or doubted my decisions, not helped by Health Visitors who just tend to lecture me about how all her sleep habits are wrong when I see them. But generally I’m aware we’re doing things the best way for our family and we’re all happy and healthy. I also read a great polemic by Zoe Williams about the sometimes toxic nature of modern parenting advice and judgement which helped to clarify things – I’m now reccomending it to pregnant friends! Making – this just did not happen. Aside from helping out a bit with a friend’s wedding (lots of pom poms) I haven’t really been making anything. This is entirely due to a lack of free time, and energy to work out what I should make. I haven’t given up though – this is making a reappearance this year. Sleep. Ha! Felicity’s sleep is so much better than this time last year, but I still might have cried if you’d told me that her sleeping through the night, even once, hadn’t happened yet. I have had seven hour stretches of sleep a couple of times, but generally I’m functioning on a few two or three hour spells over a night, which after fourteen months is rather draining. A lot of thes were a bit too much like a resolution to actually work in the way I wanted. I hoped to think of things that I could achieve the spirit of which I will try to do in 2017. This entry was posted in Be and tagged Birthday, Christmas, December, family, New Year, this month, Winter. Bookmark the permalink. I think you’ve done a great job being thoughtful, certainly with me at least. I can’t imagine functioning on that little sleep. I officially consider you a superhero now! Making did not happen for me, either. I’m sure we’ll both do more of it this year. I am only just starting to realise how much of a negative impact not being creative had on me in 2016. What a time of it you’ve had! On the bright side: you don’t have to see the health visitors AT ALL between the first and second birthdays so you get a full year off from unhelpful but vaguely official judgement.